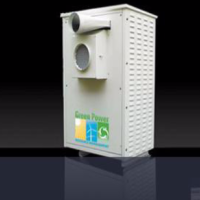 The DC Air Conditioner unit uses significantly less power than conventional A/C systems. Just imagine having to cut by more than half your AC energy cost. Contact our renewable energy experts to request a Quote and comparative analysis. The applications for the DC Air Conditioner are tremendous in Africa due to the heat environment and the high cost of standard grid-based electricity.